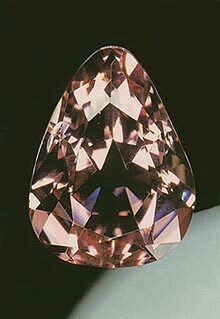 The Grand Condé is one of the most unusual of the world's notable diamonds: a light pink pear-shaped stone of 9.01 carats. Agents of Louis XIII are said to have bought the stone in 1643 after which the King presented it to Louis de Bourbon, Prince of Condé, who had distinguished himself as Commander of the French Army in the Thirty Years' War and who became known as the Grand Condé. Until his death in 1686, the Prince was known as an enthusiastic patron of the arts and an ardent admirer of various charming women, one of whom described him as a much more effective and able general than paramour! The diamond remained in the Condé family until the Duc d'Aumale bequeathed it to the French Government in 1892. Today, it is on display in the Museé de Condé in Chantilly, France, where according to the terms of the Duc's will, it must always remain. On October 11th, 1926, the diamond was stolen from the museum but later found and returned. 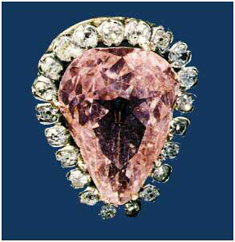 It is also known variously as the Condé Pink, the Condé Diamond, or Le Grand Condé. A glass replica of the Condé.